With the drop in temperatures, it certainly feels as though Winter is well and truly here. However, this hasn’t stopped the fun and the learning taking place in school this week. All pupils in our Reception, Year 1 and Year 2 classes were given the fantastic opportunity to learn some basic first aid skills, including how to phone for help, by calling 999, and how to answer some of the questions that a paramedic or ambulance crew might ask them in an emergency. 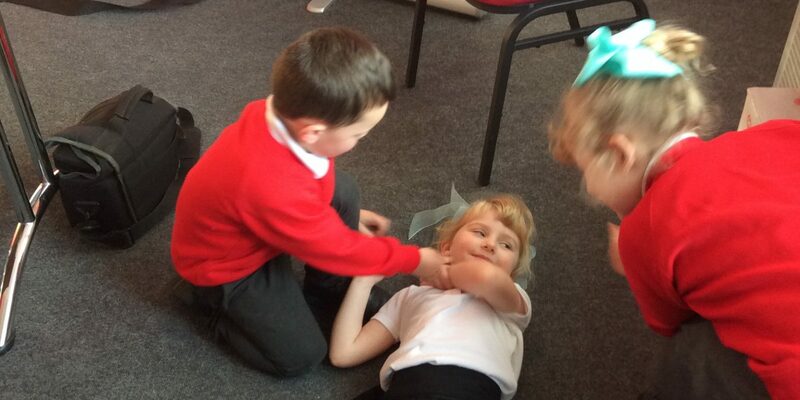 The children also practised CPR and how to safely put someone in the recovery position. Thank you to ‘Choice Medic’ for the sessions. In our Reception classes, the children have been investigating the crime scene left by the ‘Evil Pea’. The children became detectives and had to search for clues to help them solve the mystery. Children have been enjoying ‘The Golden Mile’, a new . Each week, the children find out how far they have travelled – some have covered quite a distance! I just want to draw your attention to ‘Internet Safety Week’, which takes place between the 4th – 8th February. We have a parent workshop taking place in school and we the children will be taking part in some activities, throughout this week, to support them in being safe when they are online and using social media. We will also include some useful information for parents, through our weekly bulletins. Please visit the Bexhill Observer website (or buy this week’s copy) to see Frank and Nyla in Year 6 present a cheque to the Bexhill Foodbank – thank you all for your contributions! Just to remind you that the school will be closed on Friday 1st February for in-school staff training. School will reopen on Monday 4th February. Hollie B and Freddie D in YR.
Daniel H and George D in Y1. William H and Leo H in Y2. Bow W, Madison H and Rhythm O-C in Year 3. Karina L and Millie L in Y4. Darcie J and Cameron K in Y5. Denisa V and Teddy B in Y6. The number ’168’ was chosen at random in the ‘Attendance Raffle’. This week’s ‘Champion’ is Lois H. in Year 6.